Finding a Mobility Conversion Van with a ramp that suits your physical needs doesn’t have to be a hard! Wheelchair Conversion vans are manufactured with different types of ramps and lifts to help you enter and exit safely and comfortably. Don’t let the process of finding the right van prevent you starting your search. Purchasing a Wheelchair Van for yourself or a loved one can be a huge step in increasing your overall freedom and mobility! Wheelchair Vans come equipped with several different means of entering and exiting. Ramps are commonly used as means of access. Ramps can come in side-entry (meaning the wheelchair user goes up the ramp from the side) or rear-entry (meaning the wheelchair user enters from the rear of the vehicle). Portable ramps are commonly used as a means of entering and exiting a mobility equipped vehicle. Portable ramps can be purchased online or from a mobility equipment retailer. They tend to be lightweight, flexible and can also be used when entering and exiting buildings. These ramps usually can be folded for easy storage. Track or Channel Ramps are another type of ramp that can be used for entering/exiting your wheelchair van. As opposed to having one large folding piece of wood/fiberglass, track ramps have parallel, slip-proof channels that allow the wheels of your chair to enter/exit the vehicle. Wheelchair ramps are like wheelchairs, it is important to find one that fits your body and mobility needs. Use the following guidelines when thinking about selecting a wheelchair ramp. Is the ramp you are considering wide enough? Be sure that your ramps width can accommodate with plenty of space, the width of your wheelchair. Does the ramp you are considering have the weight capacity for your wheelchair? Wheelchairs are can be heavy pieces of equipment. Make sure that your ramp can accommodate the weight of both the wheelchair and yourself in it, prior to making a selection. Does your ramp have slip-guards? Having slip-guards or rivets on your ramp can keep you entering and exiting your vehicle safely. Are you looking for a manual or motorized ramp? Some ramps deploy and stow with the use of a motor and some are manually. 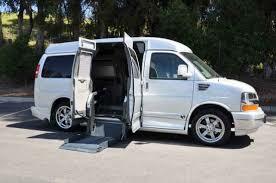 Most newer wheelchair vans will deploy/stow with motorized technology. Depending on your needs, a motorized ramp may be your best option. Incline/Degree: Take into consideration the incline and degree to which your ramp will deploy. Selecting a ramp and vehicle that gives you the ability to easily exit and enter without worry of being too steep is crucial. Safely using your ramp should be a top priority. Hopefully you find this guide helpful when searching for your next wheelchair/mobility vehicle! Finding a quality conversion van can greatly enhance your day-to-day activities! Searching for a mobility van? Classic Vans has Northern California’s biggest selection of new and used mini and full-sized wheelchair vans! For over 30 years, Classic Vans has been family owned and operated. Classic Vans specializes in pairing customers with mobility needs with quality vans. Visit www.classicvans.comor call (866) 370-8222. Find the perfect van today! Don’t live in California? No problem! Inquire about nationwide, van delivery.